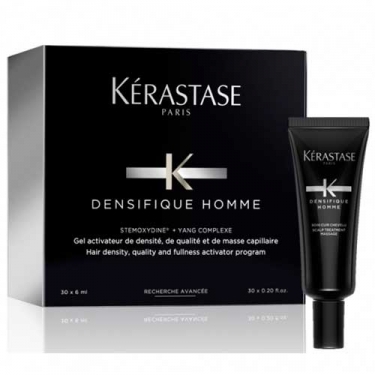 DESCRIPTION: Densify Homme from Kérastase are hair density activating gel ampoules. Offering a direct-acting scalp treatment, which should not wash, for a month, the 30-day program utilizes advanced stem cell science to help maintain hair density. The quick-drying, non-greasy formula cleverly adds body and texture to the hair and helps maintain density for fuller, healthier-looking fibbers. 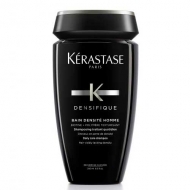 Its 5% concentration of the patented Stemoxydine molecule inspires thicker, textured hair with improved body and strength. No dripping and rapid absorption provides a perfect adherence to the scalp. 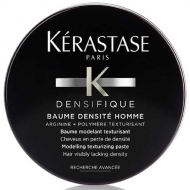 It significantly increases the amount of hair per cm2 after 3 months of use.